Since 1995, when Delaware North Companies Parks & Resorts, Inc. began managing the Visitor Complex, every aspect of this 70-acre facility has been entirely redeveloped and enhanced. From the Shuttle Launch Experience, astronaut encounters to larger-than-life IMAX® films, live shows, hands-on activities and behind-the-scenes tours, Kennedy Space Center Visitor Complex offers guests an educational, entertaining and comprehensive space program experience. Kennedy Space Center Visitor Complex is located 45 minutes east of Orlando on State Road 405, six miles inside the Kennedy Space Center entrance. From Orlando, take State Road 528 east and follow the signs to Kennedy Space Center. From Interstate 95, take exit 212 northbound or exit 215 southbound. From Merritt Island or Cocoa Beach, take State Road 3. The Visitor Complex opens at 9:00 a.m. Closing times vary by season. The U.S. Astronaut Hall of Fame is open from 12:00 p.m. - 6:00 p.m. Open daily except December 25 and certain launch days. Guests should plan to spend the day for a complete experience. Admission is $43 + tax for adults and $33 + tax for children ages 3-11. Includes the KSC Tour, Shuttle Launch Experience, IMAX® space films, U.S. Astronaut Hall of Fame®, and all attractions and exhibits. Parking is free. For group reservations of 15 or more, call 877-313-2610. Annual Passholders have year-round passage (except launch days) to Kennedy Space Center Visitor Complex, along with additional benefits. The Commander’s Club Annual Pass is $56 + tax for adults and $46 + tax for children ages 3-11, less than the price of two visits to Kennedy Space Center. Annual passes can be purchased at Kennedy Space Center Visitor Complex, by telephone at 877-313-2610 or on the web at www.KennedySpaceCenter.com. Kennedy Space Center Tour: A must-see experience, this tour takes guests on a narrated, video supplemented bus tour of Kennedy Space Center. The first stop on this go-at-your-own pace tour is the LC-39 Observation Gantry where guests enjoy a panoramic view of Kennedy Space Center and the space shuttle launch pads, as well as the rocket launch pads at Cape Canaveral Air Force Station. A short film and interactive displays demonstrate how the launch pad is constructed and how a space shuttle is launched. Buses then drive by the Vehicle Assembly Building (VAB) where the space shuttle is stacked for launch, and where the Apollo/Saturn V rockets were once assembled, as well as the Orbiter Processing Facility where the orbiter is examined and maintained after each mission. The final stop is the Apollo/Saturn V Center, where dramatic multi-media shows and numerous hands-on displays provide visitors with an inspirational and exhilarating look into America’s quest for the moon. Guests relive the historic launch of Apollo 8 at the Firing Room Theater, then marvel at a monstrous 363-foot long Saturn V moon rocket, the most powerful rocket ever built and one of only three Saturn V rockets in existence. The Apollo Treasures Gallery showcases treasures from the Apollo moon missions, including Apollo 14 Commander Alan Shepard’s spacesuit and the Apollo 14 Command Module, Kitty Hawk. Finally, the Lunar Theater provides a rare look at the harrowing final moments before man landed on the moon. The Apollo/Saturn V Center is also home to the Moon Rock Café, the only place in the world where guests can dine next to a genuine moon rock. Included with admission. Discover KSC: Today & Tomorrow Guided Tour: Led by a trained space expert, this tour gives visitors an insider’s view of the space program from launch preparation to liftoff. The tour includes up-close views of space shuttle launch pads, the Vehicle Assembly Building (VAB), massive crawler-transporters, which move the space shuttle from the VAB to its launch pad, and Shuttle Landing Facility. The tour stops in between the space shuttle launch pads, offering a close-up photo opportunity, in front of the VAB, and on the NASA Causeway where guests are surrounded by myriad rocket launch pads and may view the solid rocket booster recovery ships and native wildlife. The tour culminates at the Apollo/Saturn V Center. Price is $21 for adults and $15 for children ages 3-11 plus tax, in addition to admission. Cape Canaveral: Then & Now Guided Tour:This narrated, in-depth journey guides visitors through the Cape’s 50-year history of space exploration. Highlights include Launch Complex 5/6, site of the first two Mercury launches and the birthplace of NASA’s manned space program; the Air Force Space and Missile Museum; the Mercury Memorial; and Launch Complex 19, site of 10 manned missions in two years. The tour stops at Launch Complex 34, site of the 1967 Apollo 1 tragedy in which astronauts Gus Grissom, Edward White and Roger Chaffee perished in a fire during a launch test. The tour culminates at the Apollo/Saturn V Center. Photo ID is required for guests age 18 and older. International guests must present a valid passport to participate. Photography and video are limited to designated tour stops. Price is $21 for adults and $15 for children ages 3-11 plus tax, in addition to admission. Kennedy Space Center Visitor Complex is home to the only back-to-back IMAX theaters in the world, showcasing two large-format 3D motion pictures on five-and-a-half story tall screens. Included with admission. Shuttle Launch Experience is an incredible journey of vertically launching into space and orbiting Earth aboard the space shuttle. Guest “crew members” strap in for this all-too-real simulation, which immerses visitors in the sights, sounds and feelings of a space shuttle launch, designed under the guidance of NASA and veteran space shuttle astronauts. The five minute launch experience in the one-of-a-kind custom-designed crew cabin culminates with a breath-taking view of Earth from space. Included with admission. Astronaut Encounter: Kennedy Space Center Visitor Complex is the only place on Earth where guests have the opportunity to come face-to-face with a real astronaut every day. This half-hour, interactive question and answer session aims at inspiring children and adults alike to strive for excellence. Guests have the opportunity to have a photo taken with the astronaut following the presentation. Included with admission. Lunch With an Astronaut: Experience the once-in-a-lifetime thrill of having lunch with an actual astronaut and hearing inspiring space exploration stories while enjoying a delicious meal. Guests have the opportunity to ask questions and have photos taken with the astronaut. Price is $24.99 for adults and $15.99 for children ages 3-11 plus tax, in addition to admission. Exploration Space: Explorers Wanted: Step into the center of space travel and become part of the future of exciting possibilities at Exploration Space: Explorers Wanted. The 10,000 foot exhibit immerses visitors into an environment of discovery and exploration beyond our home planet. Live theater, interactive experiences and large scale multimedia presentations display what the future of space travel may look like, emphasizing that space exploration is not just about the hardware, but about the people behind the technology that make it all possible. The main show, Explorers Wanted, runs twice an hour, transforming the exhibit into a live theater environment. New destinations for space travel are introduced as space pioneers of tomorrow are invited to embark on new missions and embrace the challenges of future space exploration. Included with admission. STAR TREK™ LIVE: Join Starfleet Academy only to be unexpectedly whisked into an adventure steeped in the grand tradition of Star Trek. Mad Science presents STAR TREK LIVE, a live 30 minute interactive show combining cutting-edge special effects, unmatched audience interaction, cool science and on-screen appearances from Captain Kirk and Spock themselves to create an exhilarating and unforgettable theatrical experience. Live show presented three times daily in the Astronaut Encounter theater. Included with admission. 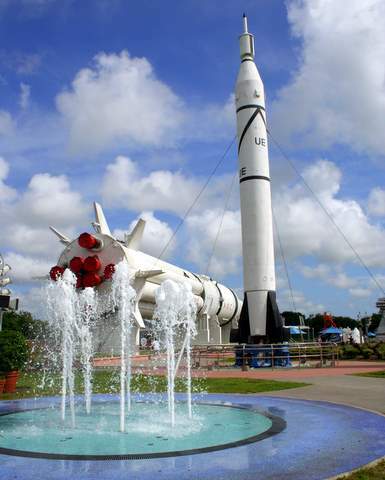 Rocket Garden: The ever-popular Rocket Garden is a Kennedy Space Center Visitor Complex hallmark. The outdoor garden features eight authentic rockets from the past, including a Mercury-Atlas rocket similar to the one used to launch John Glenn into space in 1962. Elements include dramatic lighting, water features, “climb-in” Mercury, Gemini and Apollo capsule replicas, seating and informative graphic elements. Shuttle Plaza: “Explorer,” a full-size orbiter replica, allows guests to picture more clearly what it’s like to live and work in space. Full-size, genuine solid rocket boosters and an external tank are also on display, representing all three components of a space shuttle. The Mission Status Center features live briefings on space-related topics. Early Space Exploration: Highlighting the Mercury and Gemini space programs, this facility features artifacts from the first manned spaceflights and houses the original Mercury mission control consoles. This exhibit is located adjacent to the Dr. Kurt H. Debus Conference Facility, a state of the art meeting and event facility overlooking the Rocket Garden. Eye on the Universe: The Hubble Space Telescope: From the far reaches of space come the most vibrant images known to man. Experience the powerful and stunning imagery of the Hubble Space Telescope, the most powerful telescope in history. Set in an ultra-dark environment, beautiful images showcase ancient stars, nebulas and galaxies. Nature and Technology: This exhibit showcases the unique balance between technology and nature at Kennedy Space Center, which shares a common boundary with the 140,000 acre Merritt Island National Wildlife Refuge. Robot Scouts: This walk-through exhibit highlights NASA’s unsung heroes, the unmanned planetary robot probes that pave the way for human spaceflight. Through humor and creative story lines, this attraction provides an enjoyable experience for the whole family. Astronaut Memorial: Dedicated in 1991, the Astronaut Memorial honors the 24 U.S. astronauts who gave their lives for space exploration. The 42.5-foot high by 50-foot wide “Space Mirror” brilliantly illuminates the names cut through the monument’s black granite surface. Apollo Treasures Gallery: Located at the Apollo/Saturn V Center on the Kennedy Space Center Tour, the gallery showcases treasures from the Apollo moon missions, including Apollo 14 Commander Alan Shepard’s spacesuit and the Apollo 14 Command Module, Kitty Hawk, along with a rare collection of spacesuits and other gear used by the Apollo moonwalkers. Other memorabilia includes Apollo 16 astronaut John Young’s cuff checklist with instructions on how to deploy the American flag on the moon and Apollo 13’s spacesuit repair kit. The noise, the vibrations – and the view! From countdown to lift-off, there’s nothing quite like a live, authentic space launch. An on-going schedule of manned and unmanned space launches keep eyes glued to the skies above Kennedy Space Center throughout the year. Watch a video of Kennedy Space Center and Cape Canaveral below. A Kennedy Space Center Press Release provided the information for this article.